This multiple receive frequency capability will be of special value to Repeater control stations and implements compliance with provisions of FCC Docket 18803. The FM-21 is designed for mobile operations from standard 12.6 VDC (negative ground) vehicular systems. Current consumption is sufficiently low to permit "cigarette-lighter" operations. A convenient mobile mounting bracket is furnished with the FM-21. The unit will perform as an excellent base station when used with an external power supply. 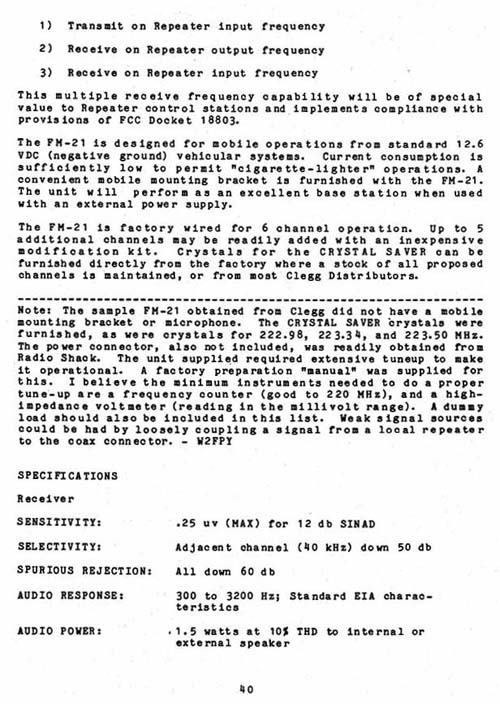 The FM-21 is factory wired for 6 channel operation. Up to 5 additional channels may be readily added with an inexpensive modification kit. Crystals for the CRYSTAL SAVER can be furnished directly from the factory where a stock of all proposed channels is maintained, or from most Clegg Distributors.